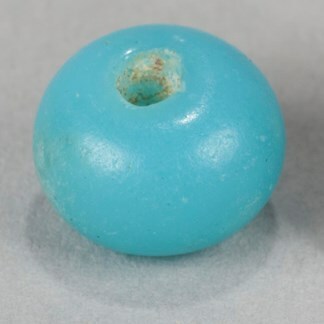 The largest bead in the collection is a light blue wound bead of the variety sometimes referred to as "Cook Type.' It is 9mm in diameter and 6.6 mm in height. This type of bead was common during the Russian period all the way through the American period (1741 - post 1867). Smaller blue wound beads like this one were more common during the early Russian period in Alaska (1741-1840). Later wound beads were larger than this one. However, it would be hard to say this is the exact time period this particular bead was from. This type was more likely to be made by hand or just a small outfit (as opposed to the potentially mass produced drawn beads. Technology-wise, a wound bead is a very early type of bead - the glass would be heated until it is workable, and then wound around a metal wire.